Albany California... it's the schools! We were meeting with home sellers today, and got to talking about school scores. Albany and Piedmont California have some of the highest Elementary, Junior, and Senior high school scores in the area. Albany homes are more affordable, that's why there's so much demand for them. I was on Cloud 9 for days ... and I still remember the feeling! Interested in Elementary, Junior High School, and High School Star (Standardized Testing and Reporting) throughout the State of California? Here's the link to the California Department of Education. 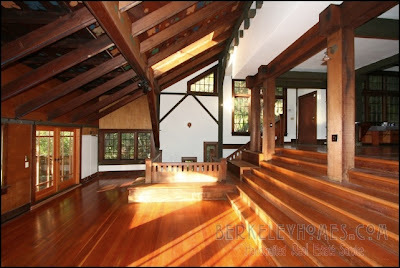 Which homes are on this week's Berkeley MLS Tour? We've always felt that our buyers first "buy" neighborhoods, then purchase the nicest home they can buy there. What better way to show which homes are for sale in the Berkeley Hills, Albany, Thousand Oaks, Rockridge than by mapping them? Carol told Mimi, a long-lost cousin (who will be visiting us in a few weeks) that "Ira likes nothing more than to be plopped down in a strange city with maps and guidebooks.. and so maps have always been a great interest to me. I've been tweaking online mapping software for years, and decided it was time to see what I could do for the Berkeley MLS Broker's Tour. And by the time we'd finished watching Tommy Lee Jones in "The Valley Of Elah", I'd put together my first draft... complete with address and pricing information... and popups which will link to the searchable MLS. Bonus: We usually visit homes starting from Kensington in the north to Rockridge in the south... so sort the geocoded mapping data first by latitude, then by longitude. View the map data points to see how well it works! Our clients receive maps, photos, detailed comments every week so they know which homes are "hot" and which are "not". If you'd value that kind of information, give us a call! Not quite ready? Just click on the link below for an update of what's for sale by neighborhood. You'll find out what's for sale.. but that's just data... you'll find that kind info all over the web. It's in the interpretation and analysis of the information that we create value for our sellers and buyers. Oh... and if you're ready to sell your home? We've a special market snapshot program just for you! Click on the image below, and you'll receive a personalize market snapshot showing your what's going on in the real estate market for homes near yours! 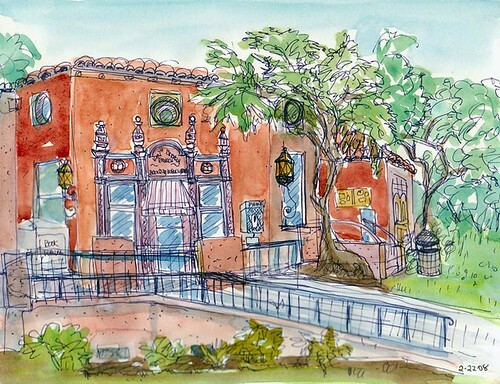 I happened across Jana's Journal and Sketch Blog this morning.... and clicked on it to see a charming sketch Jana Bouc did of the North Berkeley Library. It's a lovely sketch, and captures the character of the library. She wrote "I hadn’t realized how beautiful (and extraordinarily complicated) the landmark building of the North Berkeley Public Libary is"
The Berkeley Public Library web site says it was "Constructed in the California Spanish style, North Branch Library was designed by renowned Berkeley architect James Placheck. The structure, which opened in September 1936"
It always struck me as being built earlier than 1936, but the concrete wall construction is a bit of a giveaway that it was a WPA project. We have a bit of the library on our house.. we liked the color so much, we painted our Thousand Oaks home in similar colors. The library is at 1170 The Alameda, on a triangular parcel, an island of its own It's at the south end of tree lined The Alameda, where it intersects with Hopkins. And across the street is one of the more unusual gas stations in Berkeley... it looks like it belongs more in Amherst MA than Berkeley CA. How come there aren't many homes on the market in Berkeley right now? We’ve been in business since the 80s and at this time of year, it’s always pretty much the same….. slow with short brokers’ tours for us on Thursdays because there isn’t much that’s new on the market for us to see and report on. It’s frustrating for us too, because our buyers sometimes disappear when the house they want just doesn’t show up….or if it suddenly does, they choose not to act, or just act too late. Lack of inventory in the winter for whatever reason, wet rainy weather, seller perception that “spring is the best time to sell”, means pent-up buyer demand. So when nice homes do come on the market they get snapped up, much like they were during our hot market period and buyers still wind up competing with each other. We live in a highly desirable area and people move around, so there is turnover, just not as much as we all would like right now! I spoke with a Marin County agent yesterday and she said the same thing about her market. If April and May come along and inventory remains low, then that fact will be a genuine blip on the historical market chart....but I doubt that will happen; we always see a large number of homes come on around then. If you're thinking of selling.. this is a great time. We're seeing a high Buyers to Listings ratio, so your home will stand out! Carol referred to us reporting on homes on the market. We preview 15-20 homes each week on the Berkeley Thursday tour, send our clients extraordinarily detailed notes, comments, maps, photos… and assign each home an exclusive LTC rating between 1 and 4. Unless the house is really bad. You see, LTC stands for Lucy The Cat, and though she’s no longer with us, she lives on with her LTC rating of 1 to 4 paws. 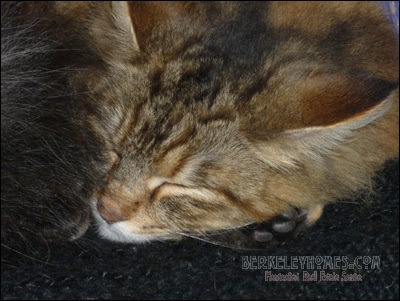 The hairball rating speaks for itself. When I first came to Berkeley in 1974 I lived on Dwight Way, and frequently strolled up to Telegraph Avenue to visit Cody's Books at Telegraph and Haste. 10 years ago, Cody's opened up in Berkeley's 4th Street Shopping Neighborhood... and I was there for the ribbon cutting! I went to buy a gift for Carol two days ago.. and Cody's didn't have it in stock. They asked me if I wanted to check one of the other local bookstores, I said sure, and the clerk called Mrs. Dalloways on College Avenue in Elmwood Berkeley.. her next call would have been to Diesel Bookstore down College Avenue in Rockridge. Mrs. Dalloways had the book, I reserved it, and picked it up within the hour. Before leaving Cody's I bought several BookSense gift cards to thank our wonderful clients for their referrals of more wonderful clients. 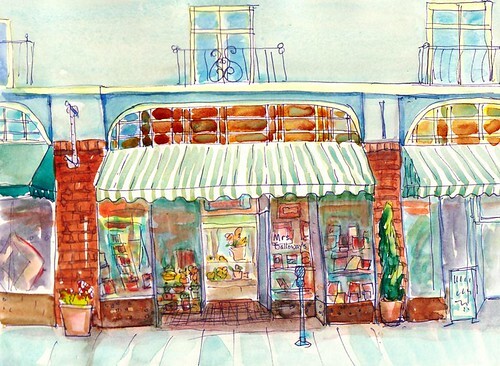 On Thursday, Carol told me that Cody's was moving from 4th Street to Shattuck Avenue in downtown Berkeley. And we'll follow them there too! Shop locally! To paraphrase what they say in Las Vegas... "The sales tax you pay in Berkeley stays in Berkeley" Or, at least a part of it does! And the book? Vermeer's Hat by Timothy Brook. It looks like it could nicely complement James Burke's Connections. If you lived in Elmwood, Claremont, North Berkeley, Central Berkeley or Rockridge you could walk to all these bookstores and more! Here's a Live update of East Bay Berkeley, Albany, Kensington, Rockridge...homes by neighborhood! 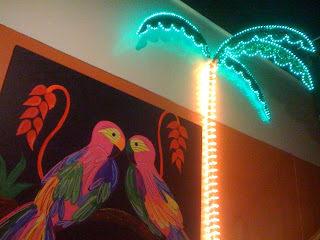 A lively Brazilian Restaurant for dinner! Pretty colors, nice music, and good food. East side of Shattuck just north of University. A Lunar Eclipse Coming To Berkeley! There's a lunar eclipse coming soon... though it was rainy today! I took this beautiful copper red moon eclipse when I lived in a beautiful home on Buena Vista Way in the Berkeley Hills. The eclipse was sometime between 1975 and 1977, and as best I can recall (actually, google) it was 18 Nov 1975. Andrew Fraknoi, my favorite Astronomy educator (and also, along with me, a Bronx Science Grad of 1966) gives his usual sage advice "Because it will begin so early in the evening, the moon will be just rising in the east, so when looking eastward it's best to choose a high vantage point lest hills or tall buildings obscure the rising moon entirely" in today's San Francisco Chronicle article "Total lunar eclipse promises to be colorful"
And if you look carefully at the photo above, you can see Baby T's (short for Baby Terrorist) eclipse of this morning's light drizzle. She was sitting on the deck when a light mist came down on the deck... and her. Then she strolled away.. but her "rain shadow" briefly remained. Interested in beautiful views from the Berkeley Hills? Here's a direct (and live link) to homes for sale... right now. Considering selling your Berkeley Home? Read what Betty McAfee and Audrey Hazen said! When it came time for us to sell our home in Berkeley, we thought we would sell it ourselves. After trying this for about a week, we realized there was much more to this than we had thought. Over the years we had been receiving impressive postcards and brochures from Ira and Carol Serkes offering to help us sell our house should we ever want to. We called them up. They came right over to our home and we had a good meeting with them around our kitchen table. We had planned to start with them and then meet with some other realtors for comparison. But we were so pleased with their approach, both appreciating our home and helping us be realistic in relation to the market, that we signed up with them right away. There was quite a bit that we had to do to get our home ready for sale and they were exceedingly helpful in all aspects of the sale, in addition to which we found them delightful to be with. Our home went on the market the day the SF Chronicle's three inch banner headline read "Mortgage Crunch!" It was a bit of a roller coaster ride for a while, but Ira and Carol rode it with us and we finalized a fine sale within a remarkably short time. Hardly a day goes by without our saying how lucky we were to have sold our beloved home at a time when it was not the easiest AND how glad we are we chose to put the house in the hands not just of realtors, but of Ira and Carol Serkes. If you are considering selling your home, we cannot imagine better people to help you. They know the real estate business well, are very computer literate and most important of all, they work with heart. Berkeley... someone wrote something nice about the city! David L. Kirp wrote an interesting Open Forum article, Semper fi, Berkeley, in today's San Francisco Chronicle. In it, he talks about Berkeley programs such as the one which encourages solar electric (photovoltaic cell) by having the city provide the upfront costs and get paid over a 20 year property tax assessment. Berkeley has an active community preparedness program. I've taken several classes and highly recommend them. Being Berkeley, there will be lots of comments upon the article - both pro and con - but I recommend reading it for yourself! I love the Berkeley Albany YMCA in Downtown Berkeley, and go 3 or 4 times a week. The people are friendly, the place is clean and tidy, and I come home relaxed. 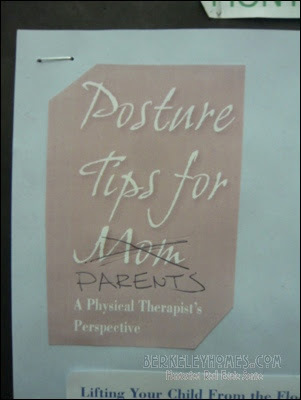 I couldn't help but smile when I saw this editorial comment on a bulletin board. And home, Dini (short for Poudini, the escape artist), awaits me! 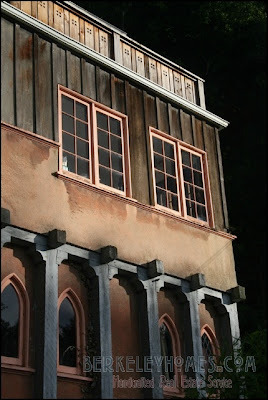 Amazing Berkeley Architecture... another reason we love living in Berkeley! Carol was holding open the Berkeley Hills Lodge in North Berkeley Hills just above UC Berkeley for the delight of our Realtor friends and neighbors. I went out on tour to see what else is on the market. We preview 15-20 homes each week for our seller and buyer clients, then report back detailed information on each home so they know what makes the home special.. or not. And then we assign each home the famous LTC Rating of 1-4. LTC = Lucy The Cat. Lucy ranks each home between 1 and 4 paws, unless it's really dreadful, at which point she gives it a "Hairball Rating"
And today was a particularly beautiful day.. with perfect light for the type of architectural photos I love to take. My adventures took me past my favorite Bernard Maybeck building, the Kennedy Recital Hall at the corner of Buena Vista Way and Euclid, then on to Claremont Hills for a home with a spectacular panoramic bay view. That brought me to Domingo Street and the Claremont Hotel. I had a quick lunch, then strolled through the Claremont Hotel grounds, returning home past Julia Morgan's magnificent home on Belrose, Greene & Greene's masterpiece on Piedmont Avenue, the International House down the street, and the Deco Printing Plant in Downtown Berkeley where the UN Charter was printed. And Carol? 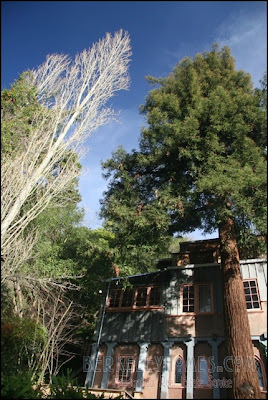 She spent the afternoon at the Berkeley Architectural Heritage Association researching the architect of the Berkeley Hills Lodge at 2652 Shasta Road in the Berkeley Hills. The day was beautiful, the light was spectacular, my polarizing filter was working (in some cases, too well) and here's what I saw. All the photos were taken this afternoon, Valentine's Day 2008, in the City I Love. And I got to come home to Carol, the woman I love. 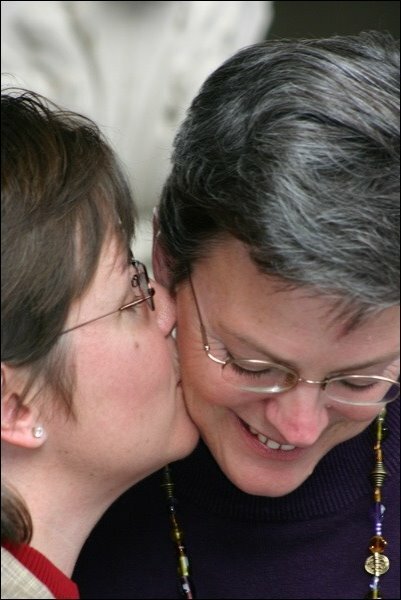 It's now four years since Carol and I went into San Francisco to see history being made. 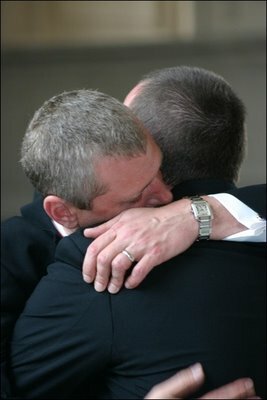 San Francisco mayor Gavin Newsom authorized his staff to issue marriage permits to couples who wanted to be married. On Tuesday, I took photos of people protesting both for, and against, the Marine Officer Recruiting Station in Berkeley. Wouldn't it make sense to allow all people who are ready to volunteer to serve our country, do so? Historic and utterly unique! 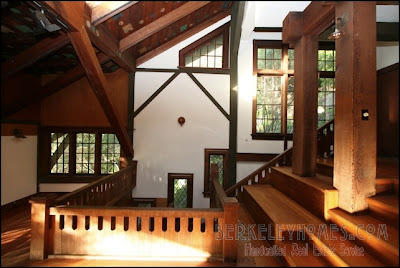 "...one of the most intriguing houses in Berkeley"
Situated in a lovely residential area on wooded and winding Shasta Road, minutes to North Berkeley shopping and restaurants; UC campus; public transportation. The property was originally part of an 1880s rock crushing operation for the stone quarry above at what is now La Loma/Glendale Park. About 1917, it was converted to a single family residence by noted architect Frederick Reimers, according to Berkeley Architectural Heritage Association records. 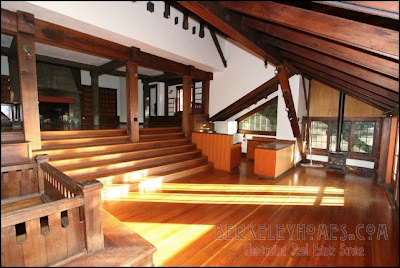 A 1949 article describes it as “...one of the most intriguing houses in Berkeley... [wooden] beams from the rock crushing equipment were utilized to build the house". Those massive beams can be seen in the Loft Unit (#3). Several of the buildings Reimers designed are listed on the National Register of Historic Places: an Art Deco car dealership on Durant in Berkeley, and Olvida Penas in Pebble Beach. Reimers was also the original architect on Eugene O’Neill’s Tao House. Now 2652 Shasta Road is a four unit building, stepped down the hillside with north bay and Mt. Tamalpais views. The Top and Loft level units have all the distinctive early century California hallmarks of the period: grand proportions; rustic wood panelled walls; redwood pillars and beams; vintage wall sconces; built-ins with glass paned cabinetry and leaded glass. Interior staircases connect all units and this could once again become a single family home. The Top and Loft levels particularly have the potential of being combined into a spectacular tri-level living space. The lower two units are more modest with some updating of kitchens and baths. More than 30 years ago I rented a wonderful apartment in the Berkeley Hills. It was between the Temple of The Wings (2800 Buena Vista Way) and Hume Castle (2900 Buena Vista Way). The scent from the Eucalyptus trees was delightful, and it was magical to wake up and be above the fog which blanketed Berkeley. On chilly evenings I had a roaring fire in the huge fireplace. Why am I telling you this? Because you now have the opportunity for your own special place in the Berkeley Hills. Imagine the most amazing loft, with golden wood floors, a wide deck across the entire front, painted ceilings, and a huge fireplace of your own. And the ability for renters to help make the payments. Historic rock quarry building converted to a residence in 1917, could be an amazing home, or combine top two units for utterly unique grand lodge living space. Stunning wood details, balcony with bay and Mt. Tam Views, stepped down the hill. The Loft - Amazing! Will it remind you of a Cathedral... or the computer game Myst... perhaps an Amphitheater... or, with its huge fireplace, one of the Maybeck on Buena Vista Way or Maybeck Twin Drive? This is one of our hand crafted homes where pictures are worth 10^3... or 10^6 words. Are you interested in shared housing? Always wanted a piece of history?... Thinking of a loft, but really want a view?.. have an extended families (in a unique Berkeley kind of family) or son(s) or daughter(s) attend UC Berkeley? Then this might be just for you! We realized that this isn’t for everyone.... so this unique property will be shown by appointment. 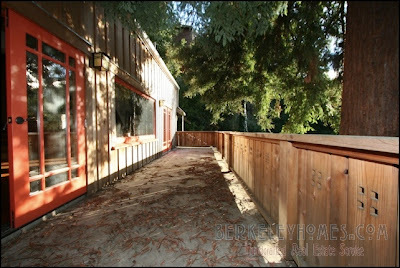 Email serkes@berkeleyhomes.com, call 510-526-6668 or Toll Free 800-887-6668 for more information. Overseas Visitors... please let me know your country and time zone and I’ll set an appointment for a VOIP Phone Call or Video Conference on Skype or .Mac (just Skype Serkes or add serkes@mac.com on your .mac account. 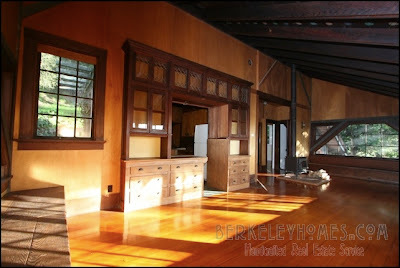 Visit http://berkeleyhillslodge.com for the extensive photo portfolio... and what it’s like living in North Berkeley, the Berkeley Hillls... and owning/managing Berkeley Rentals. I took these photos last night at the demonstrations prior to the City Council vote on the Marine Recruiting Station. Click to view all. cnn.com used the above photo on their web site! This reminded me of a famous Diane Arbus photo.